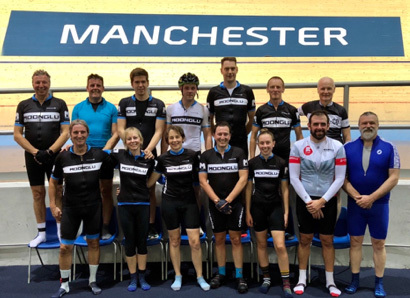 Would club members want the chance to ride the same track as Laura Kenny, Bradley Wiggins, Geraint Thomas, Katy Archibald, Joanne Rowsell Shand & Mark Cavendish to name but a few? Would they want to experience riding up to 42.5 degrees on a 250 meter round track? 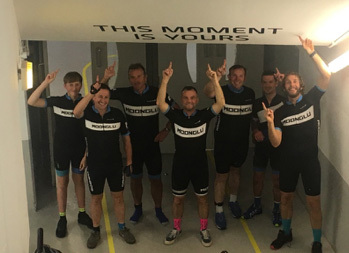 Moonglu Cycling Club set off to find out in 2017! 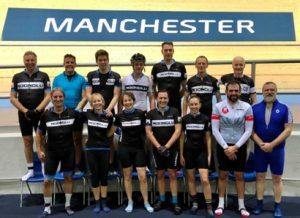 The club started to arrange trips in 2017 to the velodrome at the National Cycling Centre in Manchester where a 2-hour session has been booked exclusively for the club. Subsequently, the club has made 3 further visits to the velodrome and there is a desire to make 2 visits a year. These trips are inspired by the desire to open up a magnificent opportunity to ALLclub members, they most definitely aren’t for the exclusive attendance of young, fast racing snakes! We have had age groups from 12-60+ over the 4 visits. The 2-hour training sessions are hosted by a British Cycling coach who will oversee the training, instruction and the most important part, safety, splitting groups into first timers and more experienced members. It is always incredible to see people riding the track halfway up the banking within 30 minutes of turning their first wheel on a track. 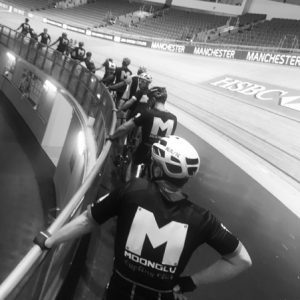 The National Cycling Centre in Manchester has a magnificent atmosphere, even when empty and the reason for that is that this is the home of British Track Cycling and this is where all of the famous names have ridden previously. There is something quite special about riding a track that has had the likes of Laura and Jason Kenny, Katie Archibald, Chris Hoy, Victoria Pendleton, Elinor Barker, Bradley Wiggins, Geraint Thomas, Mark Cavendish and Lizzie Deignan riding it previously. It is the equivalent to amateur footballers playing a game at Wembley. Track riding is obviously different to road riding in that there are no gears and no brakes, both of these you get used to quickly. You also have no garmin or the need to worry about cars!! So, there are some great plus points as well. The banking looks steep at the ends of the velodrome and that is because it is at 42.5 degrees! To conquer that and say you have ridden the track is a great achievement and an experience to savour. It also gives you just a little insight into not only how fast the best track riders are but also how immensely skilful they are, especially in the Madison! We welcome all new and existing club members to join us when we book these events and we believe they offer great value at approx. £25 for a 2 hour session (including bike hire) and we plan to continue to book the track when available.